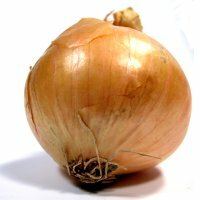 Can I Compost Onion? | Can I Compost This? Yes, you can compost onions – but with a few considerations. The top & tails you cut off when prepare onions to eat will rot down quickly – no problem. Like potatoes though, whole onions have a tendency to regrow – they’ll probably sprout new shoots and try to grow new onions before they rot down. If you want to avoid that, chop up the onion into halves or quarters before you put it in the compost bin. Cooked onions can be composted – they’ll rot down quickly – but if they have been soaked up fats or juices (especially meat juices) during the cooking process, it’s best to leave them out — the fats or juices might attract rats or other unwanted visitors to your compost heap.